Drill is fast becoming a taboo idea in rugby coaching. 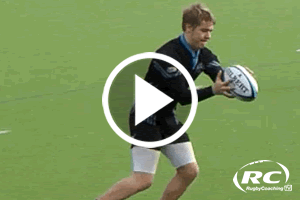 Here at RugbyCoaching.tv we believe that there is nothing wrong with a good drill if it has context and relevance to the game and its technical/tactical demands. We often see coaches delivering a fantastic array of games with a variation of rules etc. However, when we ask about actual game context or ask what does the 7 do here, we often see a lack of understanding. A lack of positional and tactical understanding of how a 7 for example, needs to practice their technical skills within a real world environment. Sadly there has been a shift away from technical practices to game based practices. These games have reduced the amount of actual coaching and simply facilitate the learner to experience a range situations in order to act or react accordingly. Although these games do have a place, we must remember that their action/reaction is based upon a technical skill set! So don’t be surprised if they cannot achieve your game based outcomes (e.g. play in wide channels) if they are unable to catch and pass competently, off both hands. In this practice we see Collin Osbourne, one of the best skills coaches in the business, explaining the importance of developing motor skills. You can see he didn’t jump straight into a game after the first exercise, it was developed into a more advanced passing practice. Both of these drills maintained context with the game as he explains how we must stop our players from drifting sideways and how important it is to practice drawing defenders! It is also important to mention the varying levels of pressure you can start to introduce in pre-game practice. Here’s a great handling practice that is passively opposed! This pressure can also be built on through adding more and more players. Creating a fully opposed environment. We would encourage you to try and create scenarios that can be repeated and add context to the sessions – eg. scrum on left hand side looking at role of 7 in attack. If we take on these principles, our sessions would be far more beneficial for the coach and the player where time is an issue! In amateur rugby; coaches and players are continually challenged by the lack of time they have. One aspect that tends to get forgotten about or ignored is the technical development of players - becoming better each week! Build upon each skill from unopposed practices to semi-opposed, fully-opposed and finally game play scenarios! Add context to the sessions, allowing players to understand the benefit of great skill execution! This would be a proactive session where we practice the skills, irrespective of what happens on the pitch on a Saturday, a move away from reactive coaching. It’s easy to run the same games each session but try and improve your players technical ability each week and you’ll see the results on the pitch!